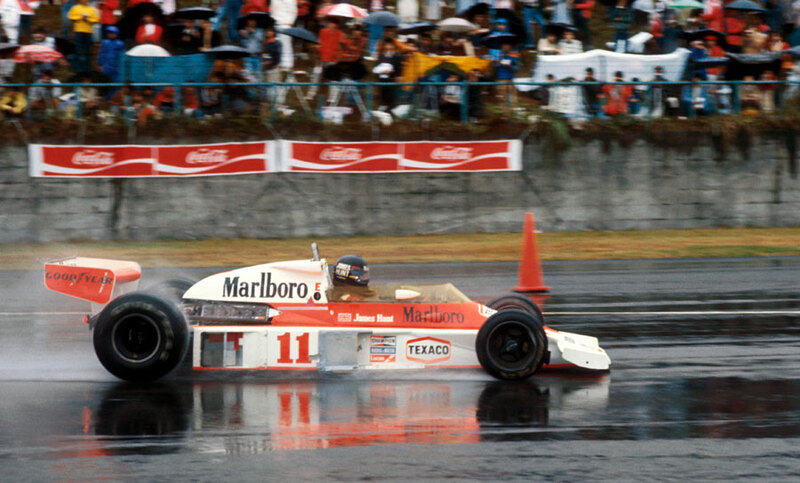 Third place at a rain-lashed inaugural Japanese Grand Prix was enough to secure James Hunt his first and only world title, a tense finale to a season of almost unprecedented on-track fluctuations and off-field drama. That Mario Andretti drove a brilliant race to take victory was almost overlooked. Interest in the season's finale attracted a record number of journalists to the Fuji Speedway, and media coverage was intense. In the UK, the BBC took the almost unheard of decision to buy live coverage of the race. Niki Lauda arrived in Japan with a three-point lead over Hunt, although if they finished level then Hunt would win by virtue of having won more races. Both engaged in mind games, with Hunt claiming he would prefer to be in a Ferrari given the track layout. Four Japanese drivers made their F1 debuts - two never raced again while the other two competed only once more. Masahiro Hasemi made a real impression in setting the fourth fastest practice time on the first day before crashing, and then recording the fastest lap in the race itself. Noritake Takahara rented a Surtees, replacing Brett Lunger, and although Hans Binder was briefly usurped by Masami Kuwashima in the Wolf, he was restored when the promised money failed to materialise. Tony Trimmer in an overhyped local Maki F102A was the subject of much interest, but for the eighth time in eight entries it failed to make the grid. Mario Andretti sneaked through to put his Lotus on pole with Hunt and Lauda right behind him, but the race day itself was wet and foggy, and it was soon apparent the grand prix would not start on time. Organisers were desperate for it to go ahead, while many drivers, after aquaplaning during the morning practice, were equally adamant the conditions were not fit. As ever, officialdom won out over common sense and once a few drivers had been persuaded to head to the grid the rest had little choice but to follow. The race started in appalling conditions which barely relented, with standing water on the track and spray rendering most drivers almost blind. The head-to-head battle between Hunt and Lauda lasted a lap, after which Lauda pulled into the pits and retired. That left Hunt needing to finish fourth to take the title. "It's like murder out there. I couldn't see a thing," Lauda explained. "It was too misty. I did not know in which direction the car was travelling. For me, there is something that is more important than the world championship." He did not mention his visibility problems were exacerbated by an inability to blink as a result of his accident. Cheered on by a soaked crowd of 72,000 who could hardly have seen a thing, Hunt took the lead off the line and held onto it for 62 of the 72 laps. The only moment of concern early on came when Vittorio Brambilla aggressively tried to pass, almost succeeding and coming close to hitting the McLaren, before he spun. Hunt stayed out on his wet tyres, gambling they would last, but in the second half of the afternoon the sun came out and they began to wear. Some drivers strayed off the now dry racing line to try to cool their tyres but Hunt did not. His team franticly signalled for him to come in to the pits for a change of tyres but Hunt, who was increasingly struggling to stay on track, refused, believing he needed to win. On the 62nd lap he was passed by Patrick Depailler as he slowed down to try to preserve the tyres. "I could not communicate with my pit team and I didn't know whether I could afford to come in," Hunt explained, "and when I did it was nearly too late." Three laps later Andretti passed, and in turn he overtook Depailler who was forced to pit with a puncture. On the 69th lap, Hunt eventually came in with his tyres close to falling apart and came out in fifth. With fresh tyres he chased down Alan Jones and Clay Regazzoni on the penultimate lap, continuing to chase down the leaders. Andretti took the chequered flag a second ahead of Depailler with Hunt a further second back in third. Hunt thought he had missed out, and was oblivious to the cheers from the stands or the gesticulations of congratulations from other teams on returning to the pits. He leapt out the car and started yelling at team boss Teddy Meyer who he believed had let him down. Slowly the message got through to Hunt who had to be reassured more than once the title was his. "[The conditions] weren't so bad for me," a delighted Hunt said. "The cars behind were getting the wheel spray." He then headed to the podium, which by this time was in near dark, collected his trophy and then the partying began.